Community meetup is an essential community building tool where the members can gather in a place to connect each other, share knowledge and experiences and plan together for the future. Each time you are in a meetup it makes the bond strong between you and the other community members as well as make new bonds with newly interested members who attend the meetup for the first time to meet any Mozillians to know more about the Mozilla products, projects and the community. Is is very inspiring to a newly recruited contributor to see in reality how a Mozillian is a essential part of the community. 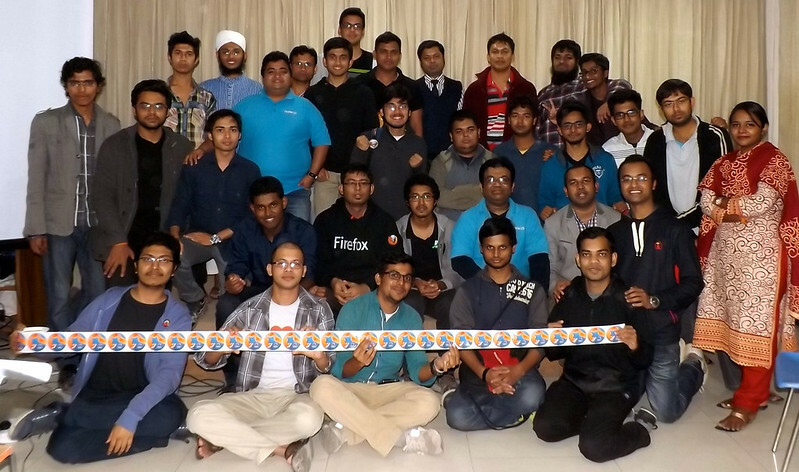 Mozilla Bangladesh also arranged a community meetup named "MozCoffee Dhaka" on 31 January 2015 at Bishwo Shahitto Kendro. That was the first community event in year 2015. You can find the agenda at the planning pad of the event but mainly we meet to share the experiences of Mozlandia attendees with all the community members and transfer the knowledge to community members about the planes of Mozilla, Mozilla products and Mozilla communities for year 2015. We've invite all the Mozlandia participants from Bangladesh, all the community member from Mozilla Bangladesh and the people who are interested in Mozilla. 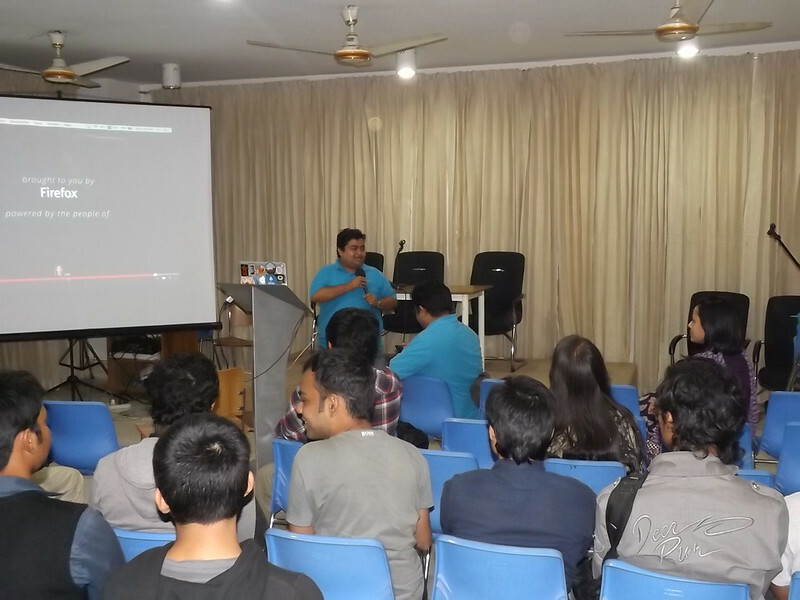 We start the event with a recap of previous year activities of Mozilla Bangladesh. As the event owner and host I do the recap with a small video prepared with the event pictures of previous year. Year 2014 was magnificent year for the community. 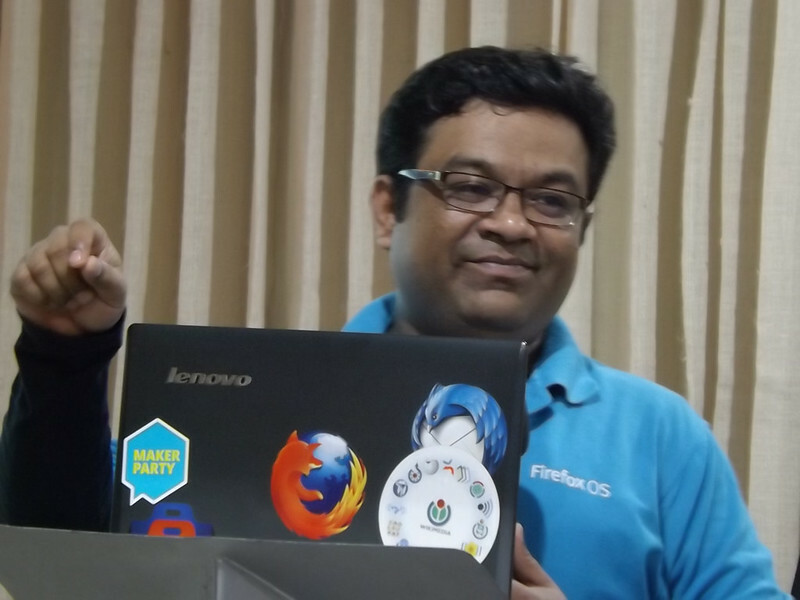 In 2014 the community grow and become solid with lot of awareness events at every corner of the country, had very successful country wide Firefox OS launch, did splendid developer engagement, significant contributions in Localization, SuMo and Webmaker. I also introduce Hossain Al Ikram to the community as he recently appointed as Mozilla Rep.
After that Mahay Alam Khan (MAK) invited to share his experiences of the workweek he participated in December 2014. He share his experiences with the localization team at Portland, discussions about to unite bn-BD and bn-IN, and how Mozilla moving forward to have a single locale for Bangla. He also discuss about the "Old Guard and New Guard" and the radical participation towards Mozilla. Then I invite Nihan Kamal to share her experiences, who is the first Mozilla employee from Bangladesh and participated in Mozlandia. As she is new to Mozilla and that was her first event to join any Mozilla event, she express her excitement and share some interesting experiences at Portland. 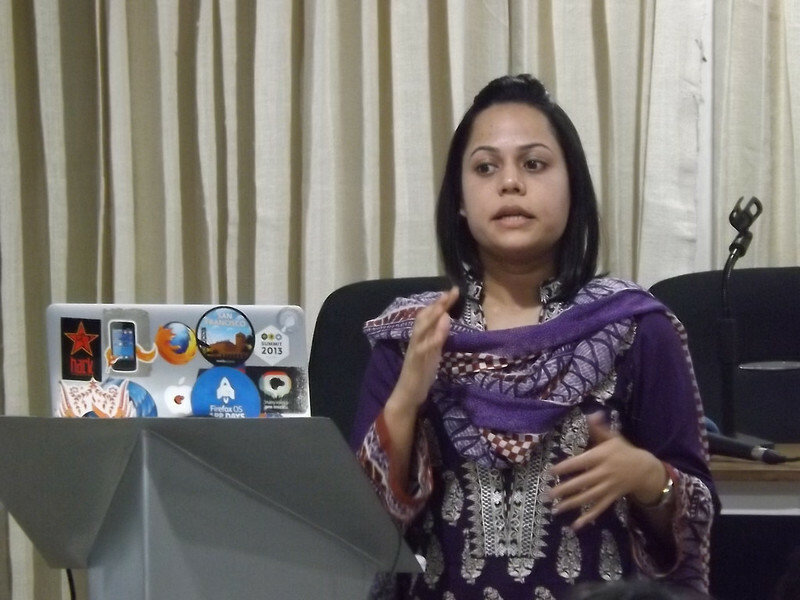 She also talked about current activities and future plans towards Firefox OS in global and local perspective. After that another Mozlandia participant Ashickur Rahman Noor was invite to join us to share his experiences. He share with us his experiences about how he managed to survive three days with a single set of dress as he lost his luggage at the airport. Also he talked about meeting with SuMo team and future plans about SuMo activities in Bangladesh. At the end we ask to participants for their questions or the topic they want to discuss or want to know. 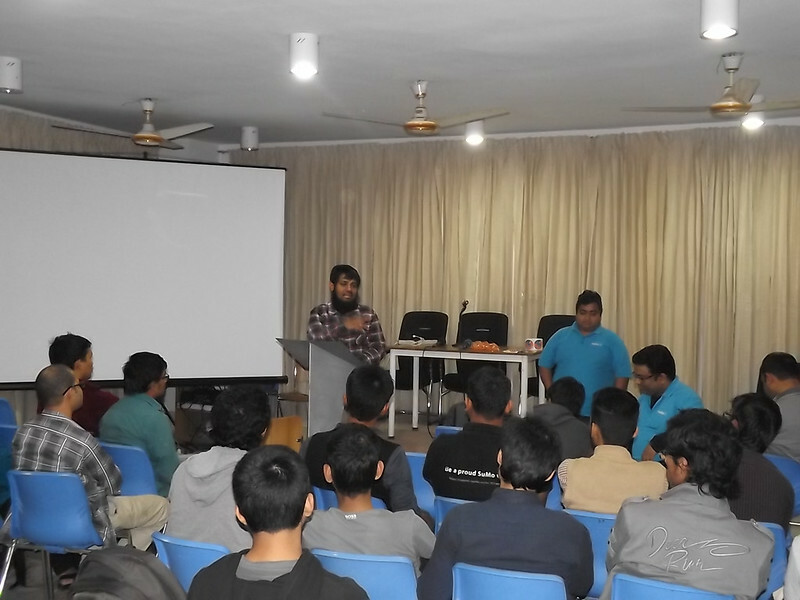 We also inform participants about our future plans, the Digital World 2015 participation, as this is the biggest ICT Expo of the country, what we are going to do to increase the coverage and contributions in Mozilla Location Services (MLS), also discussed about SuMo meetup to increase capacities of SuMo contributors in the country. We are very grateful to the participants and the speakers, as they joined us and made the the event success even in the recent political unrest of the country. Every day we are experiencing blocks and strikes in the roads now, but our Mozillians showed their love affection towards the community once again. 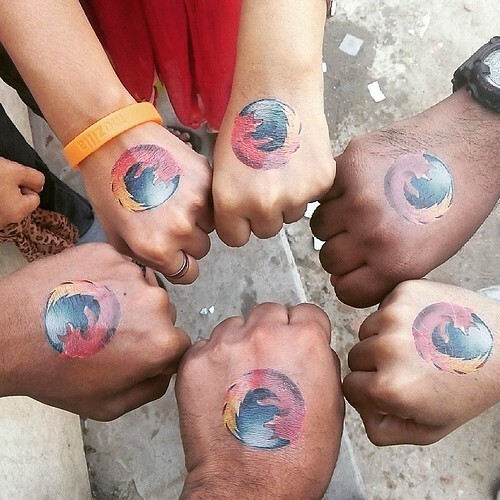 More then 70 people joined us at the meetup and around 30% of them are new to Mozilla. Thank you all. Our Mozillian (Delta) Ashfaq deserves an special thank, who worked hard to arrange the event and support me to do the event. Thank you Delta, keep continue your good work towards Mozilla and the community.